Like we did with the pushbutton lock Supra/Kidde KeySafe Pro , we have taken the NuSet Model 7060-3, electronic lock box, and customized it with tamper evident security features. 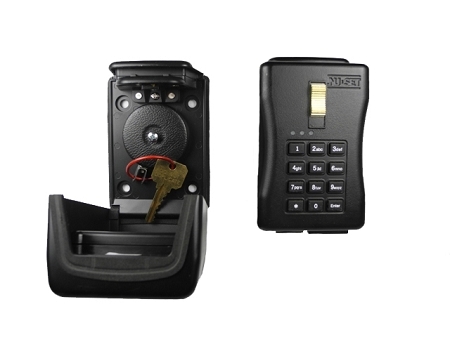 These features allow our customers to feel confident that their keys or access cards are securely attached to the key lock box and can not be duplicated without their knowledge. They also know that they are now able to monitor who accessed the lock box, when and for how long. These features are very important if you have contractors or caregivers for the elderly regularly visiting your house. Mount this key lock box next to the door or gate and you can be confident that your keys are not being duplicated without your knowledge - and the included software allows you to monitor who accessed the lock box and when. And you don't have to worry about making new keys or keeping track of who has which key.